My Mail is one of the most smart and professional WordPress plugin available in the market today. Its super simple to use. With the help of this WP plugin you can create, send and as well as track your email newsletter campaigns. Its features include auto-responder’s, track opens, clicks, unsubscriptions and bounces, track countries and cities, forward via email, schedule and campaigns, unlimited color variations, sidebar widget, unlimited subscription forums, background image support, share with social media services, and much more. The Simple WP Newsletter Plugin is a technically advanced emailer specially designed to send bulk emails. This email Newsletter Plugin can be used to send in professional newsletters to your already existing WP user database as well as the new database. Its easy to install, edit and maintain. Its rich features help in maintaining a technically advanced site. It also consists of a support team that helps in resolving all the queries within no time. 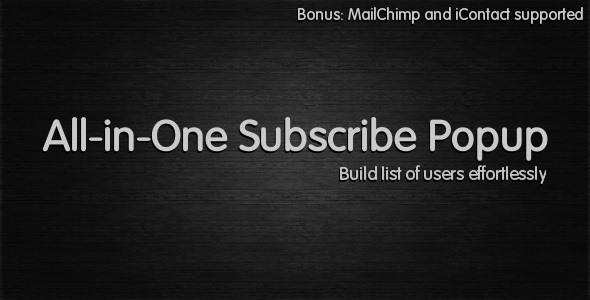 Simple Mailchimp is a clean, simple and an extremely effective Email Newsletter Plugin for WordPress. Its considered to be one of the best WP plugin available in the market today, given to its user-friendly features, that includes setting it up within a couple of minutes, displaying innumerable signup forms, fully localized, translation ready and much more. This little WP plugin helps in a great way in adding on your emailing list. For as less as $3 now you can expect to get an amazing Email Newsletter Plugin for WordPress. However, the Newsletter WordPress Widget works perfectly well only with the Newsletter Mailer (greater than 1.33 versions). You can either upload this mailer version or update it as per your requirement. It has a new support forum that can be used to clear any doubts with regards to the plugin. 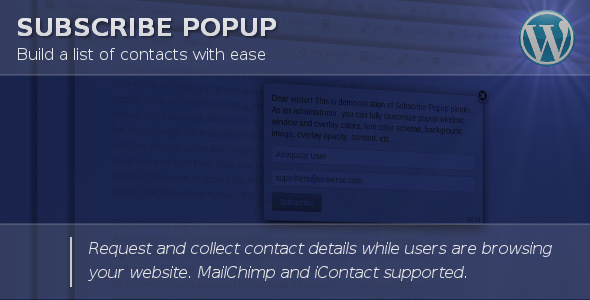 Subscribe Popup, as the name suggests, is a Email Newsletter Plugin for WordPress which when added allows the user to add on a fully customizable pop up window that would ask the visitor on the site to enter their name and email address. These details automatically gets added to your emailing list database or is sent to the iContact or MailChimp newsletter system. The information saved on these systems can be used to any other newsletter system by exporting it in the form of CSV files. If you wish to expand the functionality of your business site or blog then opting in for Subscribe Popup Plugin is the best choice. All-in-One Subscribe Popup is a one of a kind Email Newsletter Plugin for WordPress that is highly modern in nature and fully customizable. It consists of some impressive features that include Modern popup box, Modern opt-in form, WYSIWYG editor, CSV export, iContact supported, MailChimp supported, 7 subscribe popups in 1 plugin, remember visitors, accept shortcodes, translation ready,cross browser compatible etc. Its easy to install and costs just $14. The Tycoon Email Newsletter Plugin for WordPress allows the visitors on your site to subscribe & receive newsletters and recent posts on your business website or blog. It consists of a dual opt-in system which includes email confirmation as well as the administrators activating subscribers from their end. With the help of the plugin one can send regular newsletters (weekly, monthly, quarterly or yearly). Not just that, one can even send newsletters manually as per the requirements. You need to try using the plugin on your website to get a hold of all its features. Subscribe & Download is yet another Email Newsletter Plugin for WordPress, that allows the users to to distribute files by subscribing to your website or blog. If any visitor wants to download anything from your business site or any other 3rd party sites then all they need to do is just enter their contact details, after which an email link will be sent to their email address for the same. All the collected data is either stored in the database or is sent to iContact or Mailchimp system for future use. Do you want to turn every visitor into a subscriber? Do you want to expand your emailing list by putting in as less effort as you can? If yes then you ought to purchase Subscribe Traffic Pop Email Newsletter Plugin for WordPress. This little plugin adds great traffic to your site and helps you in increasing your page ranking on major search engines. It comes packed with some amazing features. You also have the option to check out its demo video before you plan to purchase it. While there are many Email Newsletter plugins that gives the visitors an option to subscribe to your site or blog, the all new Subscribe & Unlock follows a little different rules. The main content on the site in locked and protected from the general public. Only when they subscribe to your site are they allowed to have complete access to it. Thats really cool, isn’t it? Not just that but all these collected data is stored for future use. A clever step you better not miss to increase your sites visibility. Try it to trust it. The all new Simple Campaign Monitor Signup Forms, is a great way to get in more traffic to your site. This is considered as the most popular and the best Email Newsletter Plugin for WordPress available on the World Wide Web today. It can be installed in less than 5 minutes and is very easy to use. It is known for displaying innumerable sign-up forms. Its fully customizable, fully localized and is translation ready. And what more you can purchase it for as low as $6. Today’s developers come up with amazing plugins for WP that helps the webmasters to drive huge traffic to their business site or blog with less effort. Subscribe to Unlock is one among those Email Newsletter Plugins that asks the users to subscribe to the site to access any content on the site or any third party contents. Thus turning almost 95% of the visitors into subscribers. 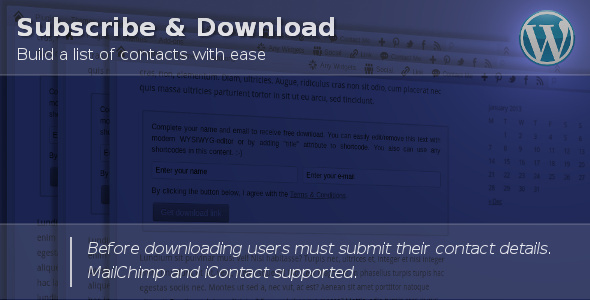 These contact details that are added to the database is sent to iContact or Mailchimp System , which could be later exported and used on other Newsletter systems as well. You might have heard about subscribing to any particular site, but have you ever heard about subscribing to any particular page or post on the site/blog? If No then its time to get to know about it. 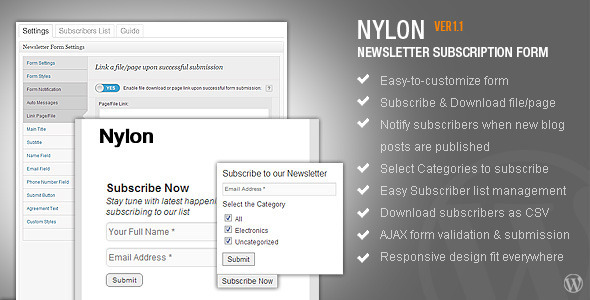 Nylon, an Email Newsletter Plugin for WordPress, allows the visitors to either subscribe to the whole site or to a page or post in particular. This means that now you don’t get all the unnecessary emails in your inbox, but just the ones you have subscribed to. Its responsive feature helps it to fit perfectly well on any device. Subscribe Content Lock is yet another Email Newsletter Plugin for WordPress that allows the users to view the content or download anything from the site by subscribing to the website. There is a content lock that is placed on some important contents on the site (certain posts and categories) which has to be unlocked before accessing the information. This is one of the ways by which webmasters expand their emailing list. The plugin comes with well documented files with user friendly instructions. Its a must try plugin.